NAMASTE - "I bow to the divine in you!". 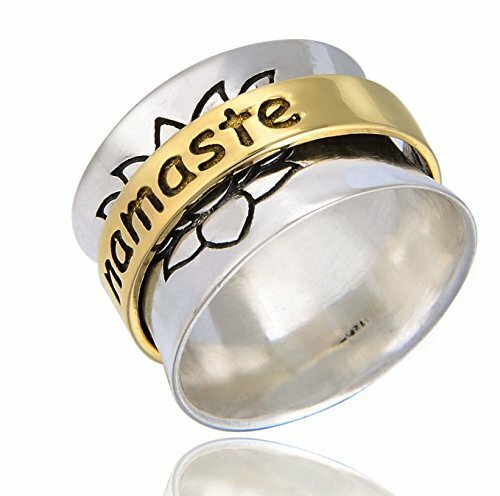 The word namaste is engraved on the brass spinner of this meditation spinning ring. A lotus peace symbol is engraved on the high polish sterling silver base ring. A simple design to remind us to express friendship and gratitude for the other person for his or her generous kindness. It makes a perfect gift to the person we would like to express his/her gratitude. This ring measures 14mm in height from knuckle to knuckle and weighs 9 grams for a size 8 ring. Because of the ring over ring nature of a spinning ring, this ring cannot be sized. Energy Stone now offers rings in half size. We have always made our rings true to size with extra room to accommodate swelling of fingers during the day. That is, we make size 7 1/4 to sell as size 7 and size 7 3/4 to sell as 7 1/2. Having said that depending on how you like the fit of your ring, customers have reflected buying one size up is a good idea for wide band does fit tighter. This ring comes with a silver cloth in a beautiful magnetic closure ring box ready for gift giving. This ring is a handmade item, information on weight, height as well as the pattern on the ring may vary slightly from the description as no two rings are identical. Humble, spiritual, calming, peaceful, thankful. Express friendship and gratitude with this ring! For best shopping experience and to ensure the ring comes in our beautiful magnetic jewelry box with a silver cloth, please make sure you are buying directly from Energy Stone! Energy Stone is the sole distributor for Energy Stone spinner rings. If you have any questions about this product by Energy Stone, contact us by completing and submitting the form below. If you are looking for a specif part number, please include it with your message.